As spoken by Dean Winchester, this message from the 200th episode of Supernatural, written by Robbie Thompson and appropriately called Fan Fiction, couldn’t have been clearer. 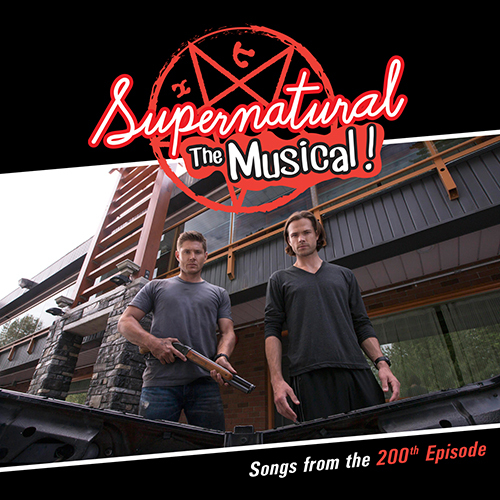 As we had already learned from the many celebratory interviews and clips leading up to the landmark chapter; Sam and Dean’s hunt of the week lands them in the world of a high school production of Supernatural the Musical. Our heroes are confronted with a fan version of their story as based on the Chuck Shurley books, embellished with all the fan fiction tropes of stereotypes, shipping, subtext, songs, fem versions of characters and even robots, ninjas and tentacles. Student writer and director Marie (Katie Sarife), with a nod to Max Fischer of Wes Anderson’s Rushmore, is very much meant to be a representation of the Supernatural fandom. She considers her play to be a transformative work and she scoffs at the “real” Sam and Dean’s various incredulous reactions to this subversion of their lives. When Dean tries to fill her in on what really happened after the end of Chuck’s books and Swan Song, Marie’s reaction to his plot summary of seasons 6 through 9 is pretty hilarious; she laughs heartily and declares it some of the worst fanfiction she has ever heard. In an interesting and appropriately meta twist, the very creation of the play is what manifests the monster of this episode: Calliope (Hannah Levien); the muse of epic poetry. She was drawn to Supernatural as it is an epic poem on life, death, resurrection, redemption and above all, family. Her goal is to protect the created work so she can consume the author, Marie, at its fulfillment. In the end it is the three versions of Sam who save the day: original cast play!Sam, who left the show because of canon issues, understudy play!Sam, played by author Marie, and the actual Sam. As Dean struggles to fight with fake prop weapons on stage, the three Sams simultaneously vanquish the monster created to protect the fanfiction work and the muse looking to gobble up its creator. You can’t get much more metaphorical than that. The episode very much fulfills its promise to be a love letter to the Supernatural fans, in my opinion. There is always a danger in meta that breaks the fourth wall between show and fans and Supernatural has paid the price for doing so in the past. Making the viewer part of the canon of a narrative blurs the lines between investment and entitlement and in this case, fans have not always come out on top. Sometimes there seems to be a real misunderstanding of who makes up the fandom, which was clear in some previous meta episodes of Supernatural, such as The Real Ghostbusters (S5.09) and Time for a Wedding (S7.08); the latter being particularly damaging to the image of the Supernatural fan. 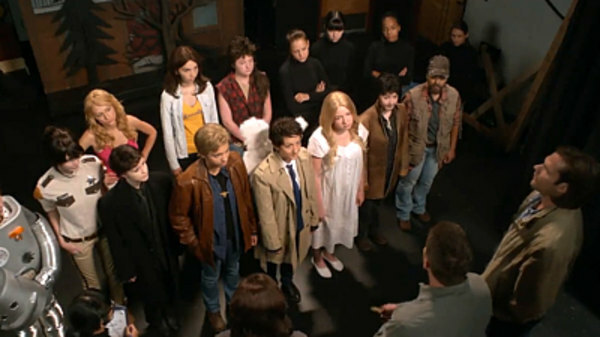 I had some hesitation before Fan Fiction aired when it became clear that the fans as portrayed in this episode were all going to be teenage girls, cosplaying iconic characters of the Supernatural universe. But I have to say that I was very pleasantly surprised. All the young actresses, especially Katie Sarife as Marie, as well as Alyssa Lynch as play!Dean, Joy Regullano as Maeve and Nina Winkler as play!Cas/Adam, were well up to the task and added a sincerity to the comedic moments that made it all feel genuine. Even the songs, besides being well written (by Jay Gruska, Christopher Lennertz and Robbie Thompson) and terrifically performed, lent more to the story than I expected. They were not just played off as funny, but actually formed a real point of connection. As much as Sam sees some charm in the high school production and relishes making fun of Dean’s discomfort, Dean has the most visceral reaction to the fan version of his life. He is not at all on board and only encourages Marie’s vision when it becomes clear that it is the only way to lure and kill the monster and save the girls. Jensen Ackles does some of his best work giving us Dean’s reactions with facial expressions, at one point even looking directly into the camera with a look worthy of House of Cards’ Frank Underwood at his most “done”. In the end, both Sam and Dean find inspiration and reflection in Marie’s version of their story, even if it differs from their own. It shows on the boys’ faces when they see play!Sam and Dean act out the iconic BM (Boy Melodrama or Broment) end scene in the Impala. “What she says” Sam says to Dean as their play counterparts have a heartfelt talk about being where they belong; on the road, just the two of them against the world. Two hundred episodes of emotions show on Sam and Dean’s faces as they watch the girls, representing their family, sing Carry On Wayward Son. This is the first time Sam and Dean get to experience that song, so sacred to Supernatural fans, as relating to their story and it’s a poignant moment, played with perfect reverence by the actors. In a great Waiting for Guffman inspired end scene we get perhaps the biggest surprise of the episode; the author himself shows up, as Chuck Shurley (Rob Benedict) smiles down on Marie and declares her play “not bad”. I really liked this episode. It was appropriately sentimental and hilarious. It hit so many emotional buttons, yet wasn’t maudlin. I also really was pleasantly surprised and relieved how it acknowledged the fans and their works in a very positive way. It could have been patronizing but it wasn’t. It showed love and use for all the versions of the Supernatural story, as each viewer and fan experiences their own, but it also drew a very clear line between those many fan versions and Sam and Dean’s “real’ life, as lived by their characters, through the show. I am with Marie and Sam and Dean; I don’t much care for the meta episodes, even if I can be amused by them. I see the danger of a deteriorating story and breaking down of the integrity of the show’s universe. I like my fourth wall in place, and as much as this episode was a love letter to the fans, I also saw a bit of a “Dear John” in all the exclamations of mutual adoration. Show and fandom can be each other’s muse, but at the risk of being consumed: you have your version and we will have ours. I am still very much on board with where Season 10 is heading, and even though this was a stand alone episode, it also served to further propel Sam and Dean back on the road, side by side where they belong; taking care of the family business. Anyone else still humming “The Road so Far” or “A Single Man Tear” as you picture that?